45x Faster Windows Kernel debugging with Virtual Machines. 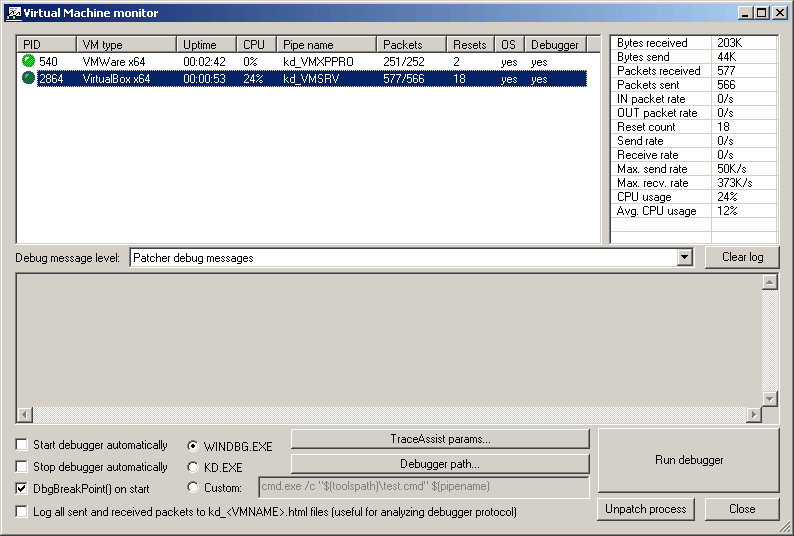 VirtualKD is a tool that improves your kernel debugging performance with VMWare and VirtualBox. It seamlessly integrates with WinDbg and dramatically reduces debugging latency. 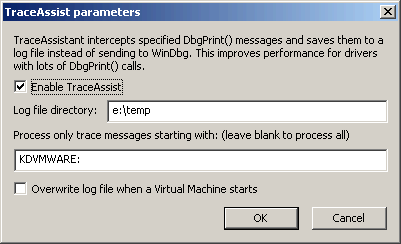 Just run the Virtual Machine Monitor, select a VM and press "Run debugger". A ready-to-go WinDbg window will appear and a faster-than-ever debugging session will start. New in version 3.0: Now compatible with Windows 10 and VirtualBox 5.x. Want to debug Linux kernel from Visual Studio? Check out our VisualKernel product! Significantly improves kernel debugging performance with VMWare and VirtualBox. Supports Windows XP to Windows 10, 32-bit and 64-bit. Fixes truncated Driver Verifier load messages. Compatible with WinDbg and VisualDDK. To download VirtualKD, see this page. The packages available to download include release build, debug build with PDB files for source-level debugging, and full source archive. Note that you need to download BazisLib library and VirtualBox sources to build VirtualKD. Please report at the forum. If something goes wrong, I strongly recommend you to download the sources and see everything in a debugger. Feel free to ask any questions on the SysProgs forum. AllowPatchingAtTableStart. Set it to 0 if your VMWare crashes when being patched. AllowReplacingFirstCommand. Set it to 1 if patching fails (and debug output indicates something like "0 free entries"). DefaultPatchingAtTableStart. You can try setting this to increase the performance (just a bit), but in can make VMWare crash on patching. Feel free to try ;) Additionally, you can set the WaitForOS to 0 in VirtualKD\Monitor to let the debugger be started immediately when a VM is detected (without waiting for OS to load). Ken Johnson (http://www.nynaeve.net) for the idea (VMKD project).